January 25, 2019 By This post may contain affiliate links. 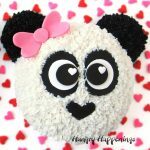 Learn how to make the cutest Panda Bear Cakes using round cakes and cupcakes decorated with white and black frosting and modeling chocolate or fondant toppers. 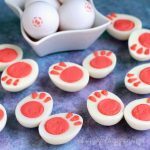 These easy panda cakes will be fun to serve for Valentine’s Day, a baby shower, a birthday party, or Sweetest Day. How sweet is this panda bear cake? 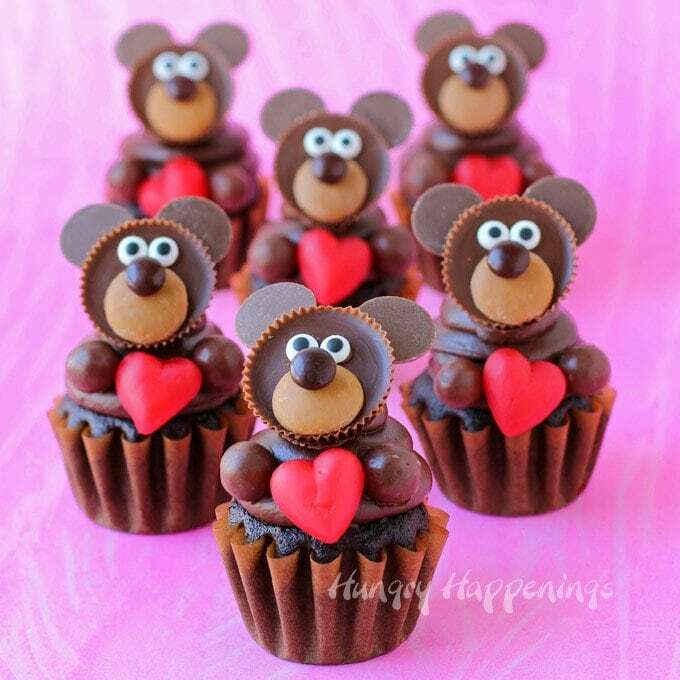 I’ve been wanting to make these cute bear cakes ever since I saw the most adorable Valentine’s Day box designed by Snowy Bliss. 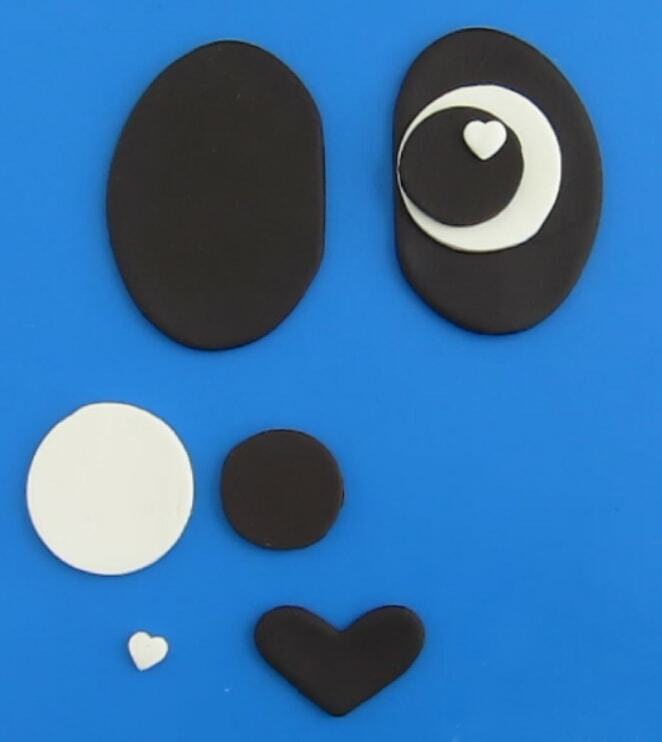 She used hearts to create the panda’s nose and highlights in the panda’s eyes. Every time I looked at the box my heart melted. I just knew her sweet design would make the cutest panda cakes ever. I love that they are so simple to create too. 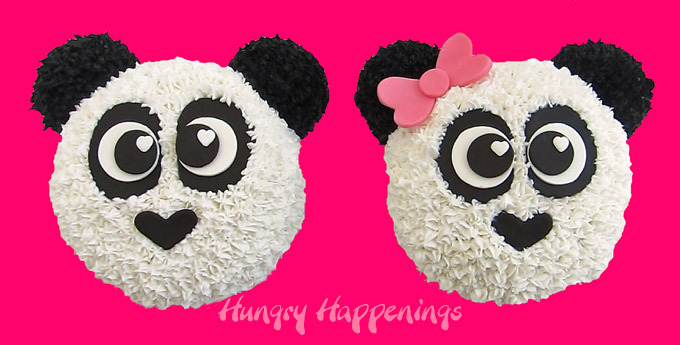 I got both of these panda cakes decorated in about 30 minutes with white and black frosting piped out using a star tip and eyes, nose and a bow crafted out of modeling chocolate (candy clay). Then I realized I put these mostly white bear cakes on a white cake board and the bears did not show up well in pictures so I spent another 15 minutes arranging red and pink heart sprinkles all over the board to give some contrast to the pictures. It turned out really cute but I do wish I would have used a colored background instead. So be smarter than me and use a large rectangle red cake board or cover your white cake board with something colorful like pink cellphane, vinyl sheets, floral foil, or modeling chocolate (candy clay) or fondant. 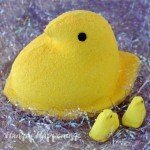 RELATED: See more Valentine’s Day or Baby Shower or Birthday ideas! You can find most of these supplies on amazon (commission earned for sales at no additional cost to you). 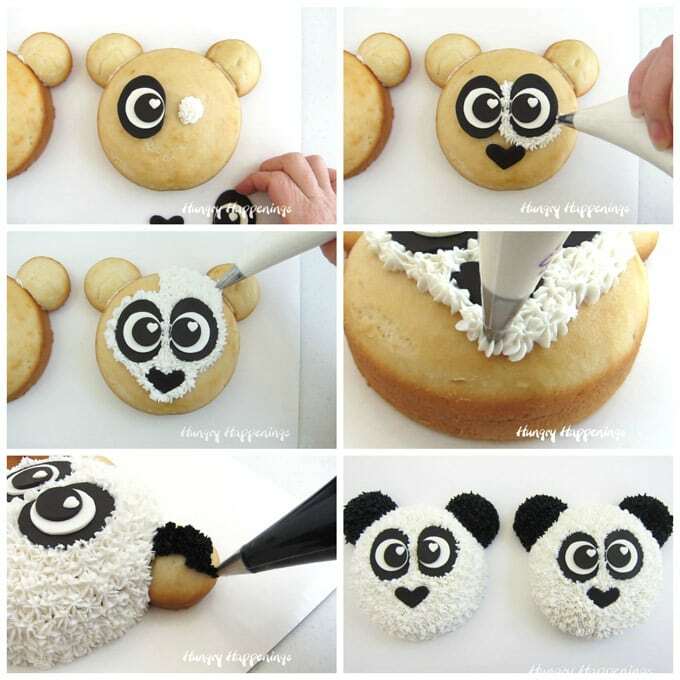 Watch this video to see how to decorate your own Panda Bear Cake then see the step-by-step instructions below. Bake two 6-inch round cakes and 4 cupcakes to make two panda bear cakes. STEP 1: Bake the cakes and cupcakes. I used a doctored a white cake mix. I added some sour cream and instant white chocolate pudding mix to make the cake really moist and flavorful. You can simply use a white cake mix, as is, or a make a white cake from scratch. How to prepare cake pans so cakes won’t stick. Butter (or grease with shortening) the bottoms and sides of the cake pans and 4 cupcake cavities. Dust them with flour then turn the pan upside down to allow the excess flour to fall out. Line the round cake pans with a round piece of parchment paper to guarantee the cake won’t stick to the pan. I don’t recommend lining the cupcake pans with liners as you want the cupcake to bake directly in the muffin tin so that you get a nicely shaped cupcake that is the right size. A liner will create a smaller cupcake with ridges. Why use a 6 inch pan? One doctored cake mix made the perfect amount of batter to fill two 6-inch round pans and 4 cupcakes. Also, if you want to use cupcakes for the ears they fit best on a 6 inch cake. 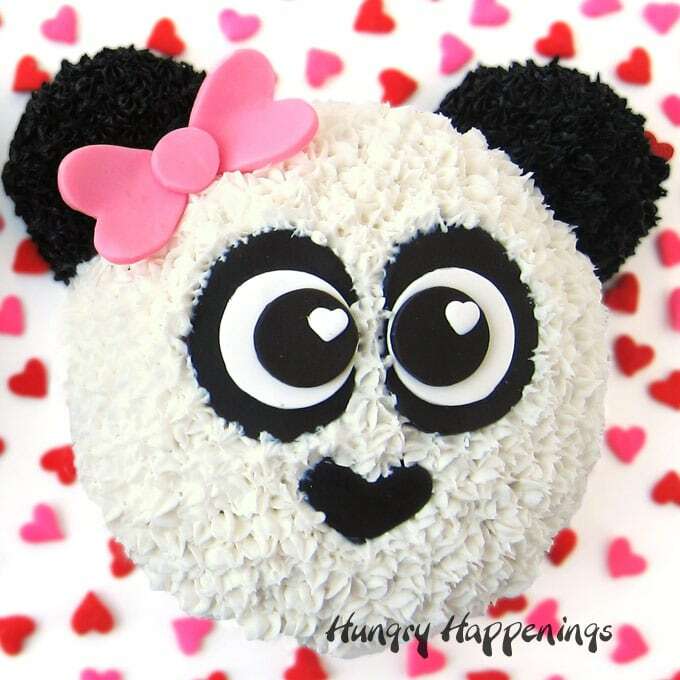 If you want to make larger 8 inch panda bear cakes then you’ll need to make more than one cake mix and you’ll need to bake the ears in jumbo cupcake pans, ramekins or small bowls. STEP 2: Cut off a small curve from each cupcake and attach to the round cakes using frosting. 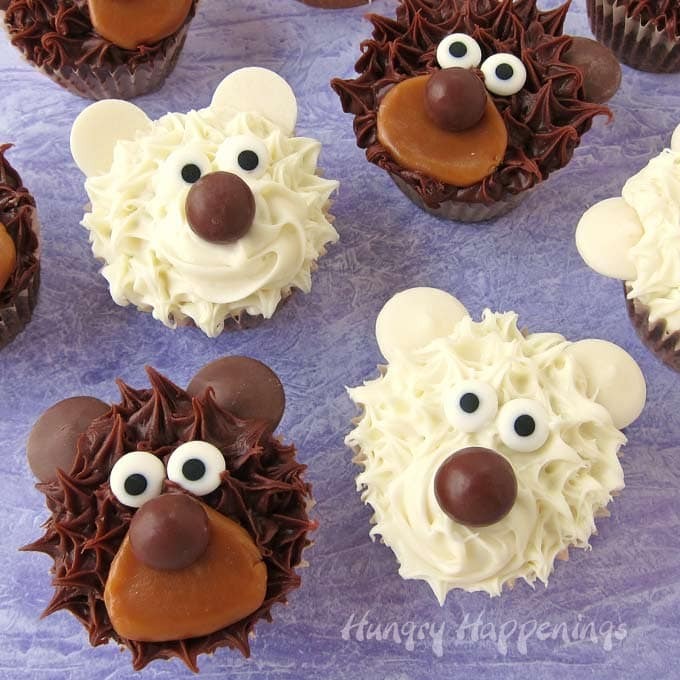 The cupcakes will become the ears for the bear cake. They need to fit up against the round cake so you want to cut off enough of each cupcake so that they fit around the curve of the larger cake. 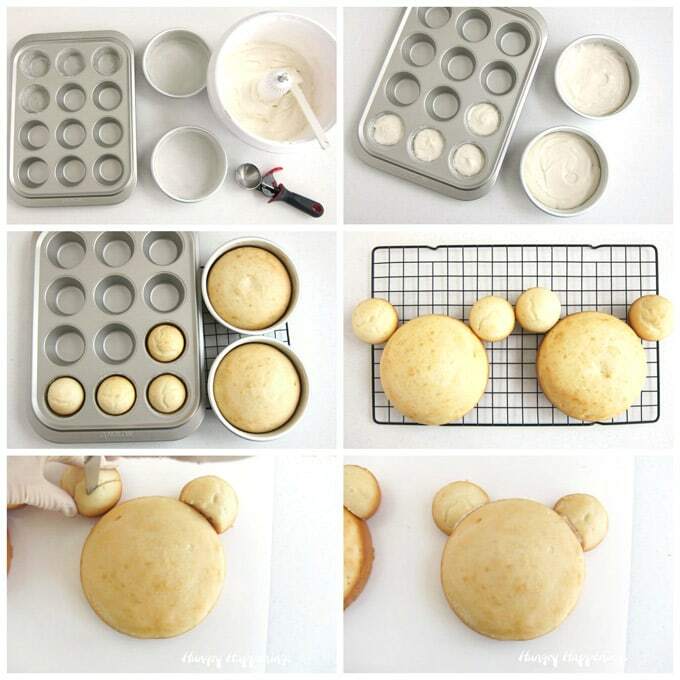 Use some frosting to attach the cupcake ears to the round cakes. STEP 3: Roll out black and white modeling chocolate (or use fondant) and cut out the pieces for the eyes and black fur patch around the eyes on each panda cake. Cut four ovals (2 for each bear) that are about 2 1/4 inches long and about 1 3/4 inches wide. You’ll notice in the video I used an oval cookie cutter then cut it and reshaped it a bit. You can easily cut this by hand. Cut four 1 1/2 inch circles from the white and four 1 inch circles from the black. Cut four small 1/4 inch hearts from the white using a plunger cutter or tiny heart cutter. 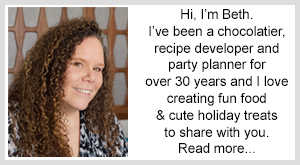 You can find my detailed recipe for making homemade modeling chocolate (or candy clay – which is made using Candy Melts) on my Chocolate Making Tips page but below are the quick directions. Be sure to check out the tips page so that you can easily make perfect modeling chocolate (that isn’t greasy or hard) the first time. Stir together 12 ounces of melted chocolate or candy melts with 1/4 – 1/3 cup of corn syrup until thickened. Cover in a zip top bag and allow to cool for at least 30 minutes. If modeling chocolate is made using confectionery coating (Candy Melts) then it is known as candy clay. I love working with candy clay. 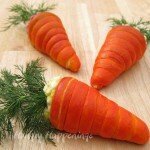 It tastes great and is easy to shape, cut, and sculpt. 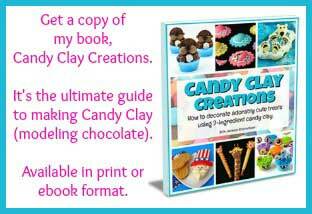 I even wrote an entire book about candy clay filled with recipes, troubleshooting tips, and 17 really fun projects. It’s called Candy Clay Creations and it’s available on amazon in print format or Kindle format. How to make black modeling chocolate. You can make black modeling chocolate by kneading black food coloring into modeling chocolate that has been made using semi-sweet chocolate. 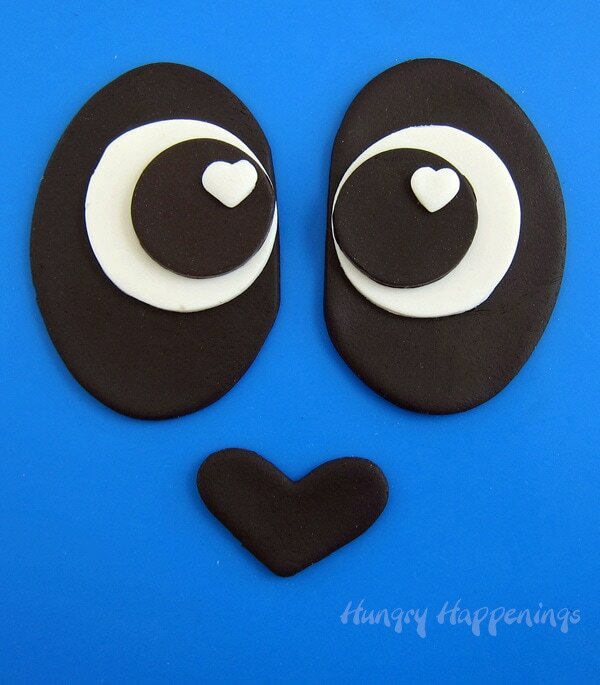 Or you can make candy clay using black Candy Melts. You’ll need to add more black coloring to get a true black color. Learn more about how to color modeling chocolate, here. How to make white modeling chocolate. If you use pure white chocolate your modeling chocolate will actually be off white. You’ll want to knead in some bright white food coloring to make it pure white. 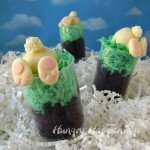 Or for a vibrant white you can just make candy clay using Bright White Candy Melts. STEP 4: Attach the modeling chocolate pieces together to create the panda’s eyes. Brush a very thin layer of water or clear piping gel on the back of one of the white circles and attach it to the black oval. Attach one black circle on the white circle to create the panda bear’s pupils. Then attach a small white heart in one corner of that pupil to be the highlight or fleck of light. Repeat creating another set of eyes. STEP 5: Cut two 1 1/2 inch long hearts from the black modeling chocolate for the noses. I squished a 1 inch heart cookie cutter to be 1 1/2 inches long. It was then wider than it was tall. You can cut this by hand if you don’t want to use a cutter. 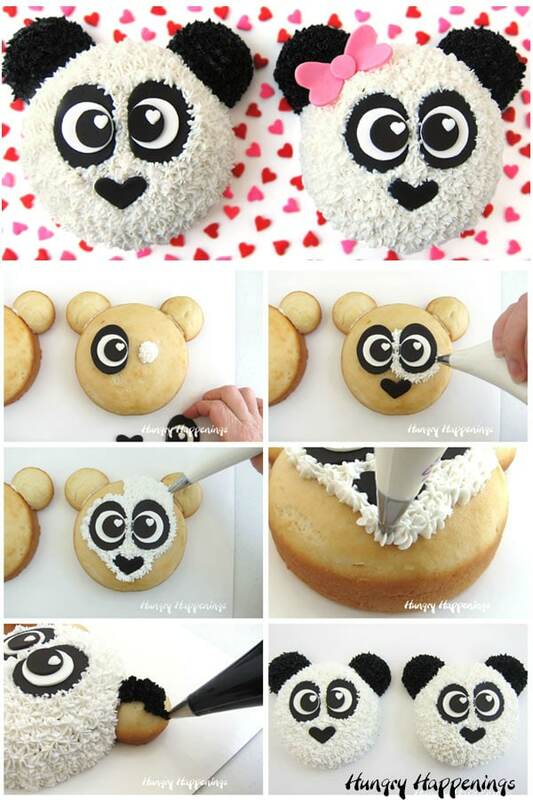 If you prefer, you can pipe the eyes and nose using frosting directly onto the panda bear cake. STEP 6: Attach the modeling chocolate eyes and nose to the round cakes using frosting. STEP 7: Frost the panda bear cakes. Spoon white frosting into a pastry bag fitted with a #21 open star pastry tip and some black frosting into another pastry bag also fitted with a star tip. Pipe white stars all over the round cakes going around the modeling chocolate eyes and nose. Pipe black stars over the cupcake ears. You can make homemade frosting using shortening (preferably hi-ratio shortening which can be purchased at cake decorating stores), butter, powdered sugar, milk, and vanilla (see the recipe below) or you can use tubs of frosting from the grocery store. If you use tubs of store-bought frosting, stir in a bit more sifted powdered sugar in order to get the frosting stiff enough to hold peaks when piped out of the star tip. How to make black frosting? To make black frosting add black food coloring to chocolate frosting instead of white frosting. You’ll need far less coloring that way. If you add enough black coloring to white frosting to get it really black it will probably taste quite bitter, so I always recommend starting with chocolate frosting. If you only have white frosting, then add some cocoa powder (preferably Dutch Cocoa powder which is darker than natural cocoa powder) to the frosting before adding the black coloring. STEP 8: Make a pink candy clay bow to attach to one of the panda bear cakes. Roll out pink candy clay and cut out two 1-inch hearts and one 1/2 inch circle and attach them together using water to create a bow. 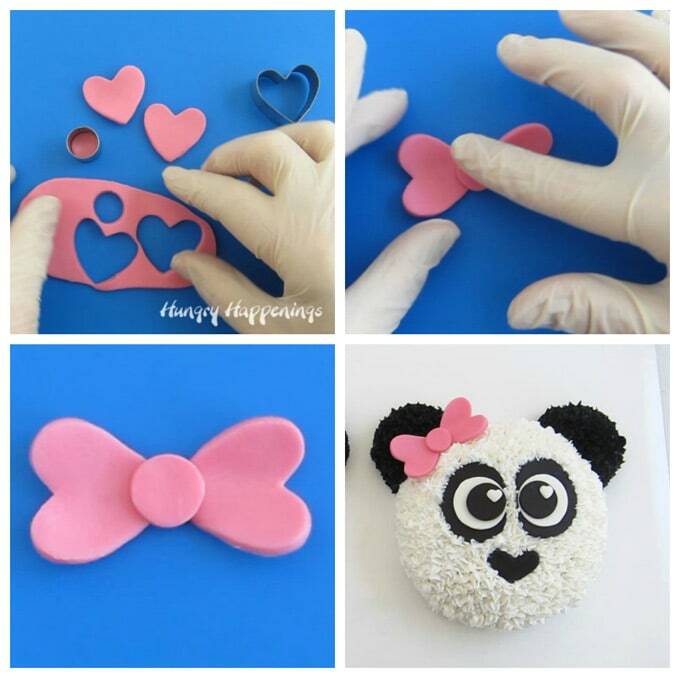 Press the pink bow onto the frosting just below the ear on one of your panda cakes. 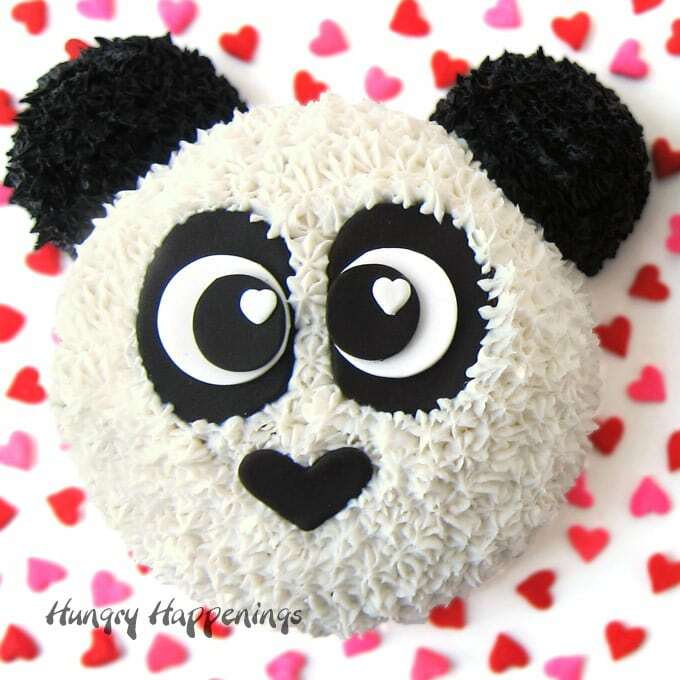 Decorate round cakes with white and black icing and modeling chocolate or candy clay or fondant to look like the cutest panda bears for Valentine's Day, a baby shower, or a birthday. Allow the cake ingredients to sit at room temperature for about an hour. Brush two 6-inch cake pans with butter then dust with flour and line with a round of parchment paper. Brush 4 cupcake cavities in a muffin tin with butter then dust with flour. Combine the cake mix, water, oil, egg whites, sour cream, and pudding mix together in a large mixing bowl. Use an electric mixer to beat on low for 30 seconds then increase speed to medium and beat for 1 1/2 minutes. Fill 4 cupcake cavities about 2/3's full with batter. Divide the remaining batter among the two 6-inch cake pans. Bake the cupcakes and cakes for 18-26 minutes removing the cupcakes as soon as they are done at around 18-20 minutes. Check the cakes at around the 22 minute mark. A toothpick inserted into the cakes should come out with just a few moist crumbs. Or the cakes should spring back when you press a finger on top. Allow the cakes and cupcakes to cool for 10 minutes in their pans then remove them and set them on a cooling rack. Peel off the parchment paper once the cakes are cooled completely. 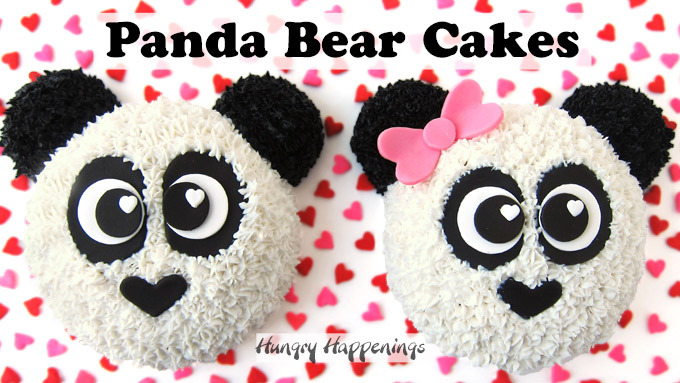 Place cakes forming two bears on a large cake board and cut each cupcake at a curve so that they fit up against the cake to form the panda bear's ears. Beat the shortening and butter together until well combined using an electric mixer. Add the vanilla and 3 tablespoons of the milk and beat until fully incorporated and the frosting is smooth. Add more milk as needed to make the frosting soft enough to pipe through a star tip yet hold it's shape. Spoon 2/3 cup of the frosting into another bowl. Stir the cocoa powder into that small bowl of frosting then color using black food coloring and add more milk, if needed. Roll out the black, white, and pink modeling chocolate to about 1/8th inch thickness on a silicone mat using a silicone rolling pin. Cut four 2 1/4 inch by 1 3/4 inch ovals from the black modeling chocolate. Cut four 1 1/2 inch circles from the white, four small 1/4 inch hearts from the white and four 1 inch circles from the black. 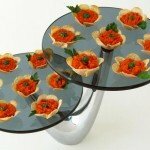 Attach one white circle to one black oval using a thin layer of water or clear piping gel. Attach one black circle on top of the white circle then attach one small white heart along one edge of the black circle. Repeat creating 4 eyes with all the hearts pointing up or down in one direction. Cut out two 1 1/2 inch long heart shaped noses from the black modeling chocolate. Cut two 1 inch hearts and one 1/2 inch circle from the pink modeling chocolate. Place the two points of the heart together then attach the circle over the top of the tips using water or piping gel to form a cute bow. Attach two eyes and a nose using frosting to each round cake. Pipe white frosting using a star tip over the entire surface of the round cakes around the eyes and nose. Pipe black frosting stars over the cupcake ears. Press the pink modeling chocolate bow just below one ear of one of the panda cakes. Allow the frosting to crust over then cover the panda bear cakes with a large box or plastic wrap and store at room temperature for up to 2 days. These panda cakes are easy to decorate by piping stars all over the surface of your cake. Fill a pastry bag that is fitted with a star tip with frosting. Set the start tip just above your cake. Squeeze just until a small star shaped bit of frosting comes out of the bag making sure the frosting is attached to the cake surface. Then quit squeezing and pull up quickly creating a peak. If you want you can simple frost the cake using a spatula or you can make a really furry cake using a multi-opening grass tip instead of the star tip. These panda cakes can be stored at room temperature for 2-3 days. Allow the frosting to crust over before covering the bear cakes with plastic wrap. I then like to cover my cakes with a large plastic container or box. I don’t recommend storing these cakes in the refrigerator as they will dry out but you can place left over slices in an airtight container and store in the fridge if needed. Any modeling chocolate that gets refrigerated with develop condensation on it’s surface which will make the decorations sticky. Can I freeze these panda cakes? You can freeze the cakes themselves, but I would wait to decorate them until the day or so before you want to serve them. Modeling chocolate should not be frozen or refrigerated (see comment above). 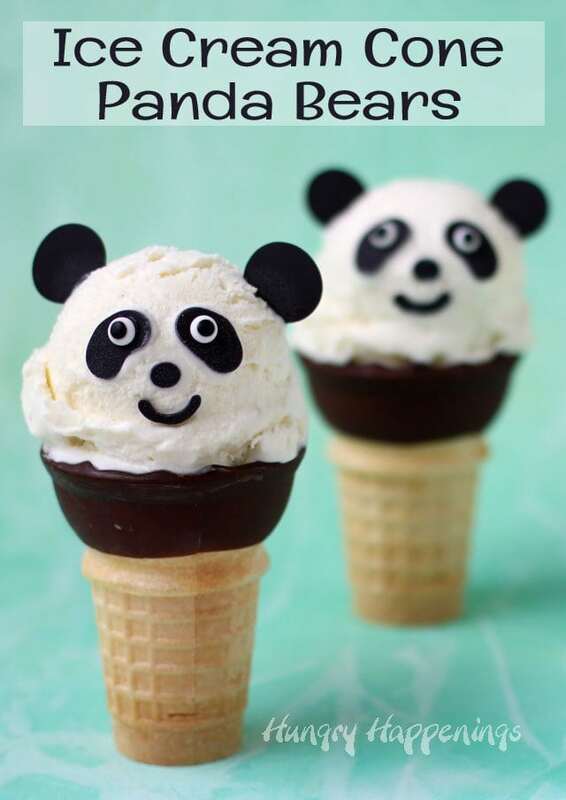 Can I make panda bear cupcakes? Yes, if you don’t want to make a panda cake you can use the decorating technique to make cupcakes. You’ll just need to cut everything smaller. See all my Valentine’s Day Recipe Ideas, here! What Valentine’s Day cakes have you made? 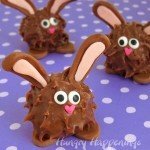 Fun food for special occasions or every day! 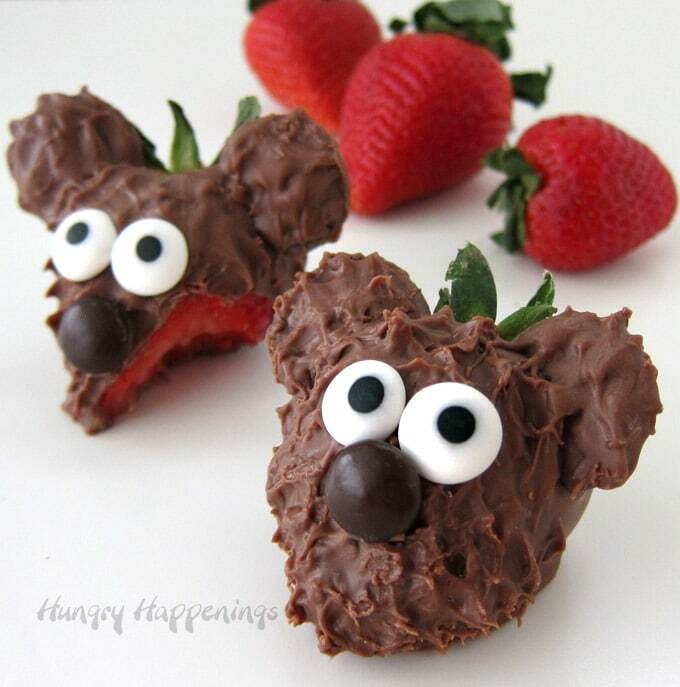 Cuz I love creating cute food that makes people smile more than I like cooking dinner! It is a Nutrimill Artiste. This was the first time I used it and it mixed the batter really well. I love that I can easily add ingredients and that the beaters really got into the corner of the bowl. It comes with a lid that you can slide open which is really great too. You can find them on amazon here – https://amzn.to/2RLW0a5. They are primarily white but you have the option of having a red, black, or grey stripe. That is an affiliate link. 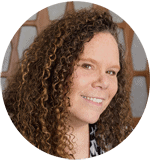 I earn a small commission at no extra cost to you. These cakes are super cute Beth! !